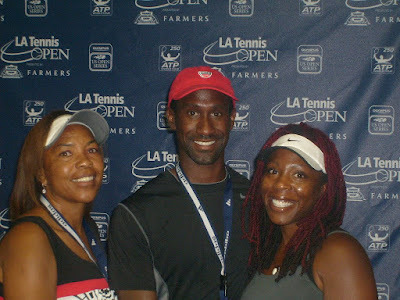 USTA Southern California Diversity & Inclusion Multicultural Participation Coordinator Ronita Elder, USTA Strength & Conditioning Specialist Rodney Marshall, and local recreational tennis player and enthusiast Jasmyne Cannick at the 2009 Los Angeles Tennis Open at U.C.L.A. Wednesday, July 29, 2009. Rodney Marshall is tennis pro Donald Young's Strength & Conditioning trainer.